Is it true that “All spicy food is from Latin America”? There really was no spicy food in the world before the Columbian Exchange. Before the Columbian Exchange, there were no chilies outside of the Americas. Which is to say, when Christopher Columbus set sail for India in 1492, Indian food wasn’t spicy. Thai food wasn’t spicy (in the sense of “spicy’ as in the heat-pain that chilies impart). There was no spicy Chinese food. All Spicy Food Is From Latin America. To what extent is the above claim true? The Japanese wasabi - according to this page, "The first Japanese medical encyclopaedia called 'Honzo-wamyo'” was published in A.D. 918 and it states that “wild ginger” (Wasabia japonica) had been grown in Japan for at least a thousand years"
One journal article claims that the Korean chili pepper gochu has been cultivated for at least 1,500 years. However, this journal article has been criticized by several commenters below (now moved to chat) and was also recently thoroughly debunked by wotan_weevil at Reddit - Ask Historians (I found this only a number of days after first posting this question). But perhaps wasabi, gochu, and the Szechuan pepper were rare examples and for the most part the claim of this question's title is true. Several have correctly pointed out that the word spicy is unfortunately quite ambiguous in English. For example, cinnamon and nutmeg are spices, but are not what I mean by spicy in the current context. In other languages there are words for what I am thinking of in much more unambiguous terms --- picante in Spanish, 辣 in Chinese, or pedas in Malay. "What was Indian food like before contact with the New World?" "What was Asian cuisine like before the Colombian exchange?" What did "Old World" cuisines that are today known for their spicy foods taste like before peppers were imported from the Americas? What is the history of curry? Who invented it? How did it spread? Is it really a British thing and not Indian? Hot peppers originally came from the Americas, but India, Thailand, and large parts of China are famous for their spicy foods. How did they arrive, and how long was it before they became an integral part of the cuisine? "What was Indian cuisine all about before potatoes, chilies, and tomatoes were brought to India?" We had a glimpse in the last chapter that chillis are not really Indian. These wonderful materials were brought to India from Mexico, perhaps in the late 16th century. They took a little while to catch on, but in about a hundred years, the use of chillis spread to every part of India. Before that, it was pepper that was used to give the pungency that is so characteristic of Indian food. In one of the sections of the Ain-i-Akbari, written in 1590, there is a list of 50 dishes cooked in Akbar's court: all of them use only pepper to impart spiciness. In most Indian languages, the name for the chilli is simply a variation of the earlier name for pepper in the same language. For example, in Hindi, we say kalimirch (black pepper) for pepper and harimirch (green pepper) for chilli. 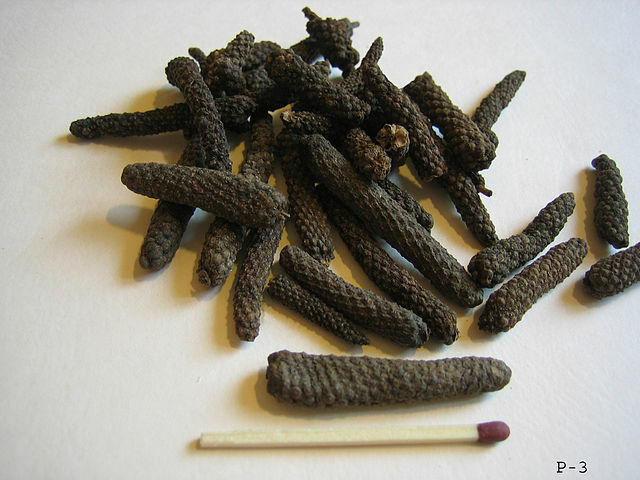 In Tamil, the word for pepper is milagu and that for chilli is milagai (= milagu-kai (pepper+fruit)). In Kannada, the words are karimenasu and menasinkayi. Try this exercise in your own language. It is not difficult to understand why the chilli so quickly replaced pepper in our cooking. While the pepper vine grows almost only in Kerala, chillis can be grown in almost every backyard, or cultivated in fields, all over the country. Thus, they were easily avaliable everywhere at a low price. All the many varieties that we know come to us from Mexico and none of them was developed afterwards in India. These include the green chilli, red chilli, long red chilli, very small and very hot green bird chilli, and the large mild capsicum. To make chillipowder, the long bright-red variety with thin skins can be dried in the sun, and ground either with its seeds to give more pungency, or without it to give a milder chilli-powder. In fact, it is no exaggeration to say that the humble chilli from Mexico really revolutionized the food of India. While it is true that most hot spices originated in the Americas, spicy food was evident in most ancient civilizations and originated from many different regions of the world. All of the well-known ancient civilizations used a complement of typical spices. If saffron was the most exclusive spice, pepper was the most common in medieval Europe. It was consumed by the rich and those of more modest means, albeit in smaller quantities. I live in Thailand, and I wondered about the same. I asked this question to several Thais with some knowledge in history. Chili peppers come from the Americas. That's correct. They are imported into Asia. Also correct. But the peppercorn from the black pepper is native to Asia. This was - and still is - in use before Europeans introduced Chili peppers to Asia. Black, white and green pepper come all from the same plant. Mustard, horseradish, ginger and cumin all grow in the old world and are by most definitions spicy. This is more of a language use problem, in several ways. The first comment is correct in stating that capsaicin containing dishes (these are the "hot, spicy") are very popular in Asia now. But in Asia it was impossible for those dishes to contain capsaicin before Columbus. The whole genus Capsicum was simply absent from Asia before 1500. Many Asians are oblivious to the fact and surprised to learn that chili-pepper is not like black pepper originally native to Asia. Despite its name, C. chinense or "Chinese capsicum" is misleading. All Capsicum species originated in the New World. Nikolaus Joseph von Jacquin (1727–1817), a Dutch botanist, erroneously named the species in 1776, because he believed they originated in China due to their prevalence in Chinese cuisine after their introduction by European explorers. The blog post uses even less precise language, as first of all those dishes in Asia alluded to originate from Asia. And more importantly second: it drops the signifier 'hot' and equates 'spicy' with 'capsaicin containing'. But that is a peculiarism of usage, ambiguous in itself and not universal to all variants of the English language, differing by regions. Difference between “spicy” and “hot” I make a distinction between "hot" and "spicy" food ("hot" not referring to temperature). I consider "hot" food the kind that "burns" and "spicy" food that has lots of flavor, but that may or may not "burn", but has some "heat" to it and is flavorful. I've been told that there is no real difference between the two and that I'm crazy for thinking that Tabasco sauce makes something "hot", while something like curry, ginger, or cumin makes something "spicy". Please help me out a little here with a little clarification. The terms "pungent" and "pungency" are rarely used in colloquial speech but are preferred by scientists as they eliminate the potential ambiguity arising from use of the words "hot" and "spicy", which can also refer to temperature and the presence of spices, respectively. For instance, a pumpkin pie can be both hot (out of the oven) and spicy (due to the common inclusion of spices such as cinnamon, nutmeg, allspice, mace, and cloves), but it is not pungent. (A food critic may nevertheless use the word "piquant" to describe such a pie, especially if it is exceptionally well-seasoned.) Conversely, pure capsaicin is pungent, yet it is not naturally accompanied by a hot temperature or spices. As the Oxford, Collins, and Merriam-Webster dictionaries explain, the term "piquancy" refers to mild pungency and flavors and spices that are much less strong than chilli peppers, including, for example, the strong flavor of some tomatoes. In other words, pungency always refers to a very strong taste whereas piquancy refers to any spices and foods that are "agreeably stimulating to the palate", in other words to food that is spicy in the general sense of "well-spiced". Going from that wikipage to corresponding entries illustrates that this problem is largely absent from other languages, but there are others around the fruit. The problem is entrenched and likely to persist. "Piquant" is not frequently used, so could seem pretentious. ME: Do you use 'spicy' in that way? Is that not more like "hot". Re-checked a couple dictionaries and it is always just listing 'copious amounts of spices'. TED: Yes, I do. Something with lots of Oregano in it is not "spicy". In English 'spicy/hot' doesn't always mean 'with chillies' as many people find even weak "French" mustard to be 'spicy/hot'.Mustard can be considered 'spicy' in England but standard English mustard is not spicy due to the addition of chillies, it is the mustard seeds themselves, they are Brassicas and do not contain capsaicin. Most spices are really just flavourings and do not contain capsaicin. Asking for no chilli should still allow you to have a flavourful dish without the pain but some people may mistake no chilli for no spices but at least your food will be warmer than the ambient temperature and not contain chilli rather than at, or cooler than, the ambient temperature and not contain chilli. So Asians used pepper and other spices well before Columbus. Then they were introduced to capsaicin containing plants and allspice. Asian dishes are from Asia and contained spices before the columbian exchange. Another exchange to observe is that the very word "spicy" changed its meaning by that and for some refers exclusively to chili-pepper dishes. - Of food or drink: prepared by heating and served before cooling. - Of a food, drink, spice, etc. : having a taste or smell characterized by a burning sensation; pungently spicy; acrid, biting. Also of a taste or smell (occasionally in figurative contexts). - Having the characteristic qualities of spice; of the nature of spice. - Flavoured or mixed with spice. The most intriguing part about this is that in English the familiar Piper nigrum (black) pepper gave its name away to all these spicy-hot chili peppers and variant spellings and meanings, because of their similarity in tongue sensations. All while Columbus had set sail to find trade routes for the spices, now in some parts of the world only those dishes containing plants discovered after Columbus are called spicy? Quite a carrousel indeed. The claim is correct if spicy is equated with capsaicin, and the claim is correct if it is assumed that nearly all popular spicy Asian dishes with their recipes from today would be missing a crucial ingredient without Latin Americas gift to the culinary world. Etymologists believe that “curry” originally came from kari, a word in Tamil that means sauce or gravy. The history of this preparation goes back more than 4,000 years to the Indus Valley civilization, where people often used stone mortar and pestle to finely grind spices such as fennel, mustard, cumin and others. In fact, excavations at Harappa and Mohenjodaro have unearthed pottery fragments with traces of turmeric and ginger, belonging to the period between 2600 – 2200 BC, thus making curry (or at least the predecessor to curry) one of the oldest food items in the world. As pointed out by historians, the curry was often eaten with rice, which was already being cultivated in the area. Sumerian tablets that have survived also talk of a similar food recipe for meat in some kind of spicy gravy and served with bread, as early as 1700 BC. The Apicius cookbook of the 4th century AD contains many meat recipes that were cooked in a similar fashion, with the use of ingredients like coriander, vinegar, mint, cumin and so on. Authored in the 1390s, The Forme of Cury is significant for possessing the earliest reference to the word “cury”, though it was taken from the French term “cuire” for cooking. With the arrival of the Portuguese in Goa in the 15th century as well as the Mughals in India in the early 16th century, the curry recipe underwent multiple revisions. If we just put aside the dubious language definitions completely. And if we put aside the equally dubious chemical reductionist stance of the scoville scale that measures pungency just by casicin content. Then we can still trust our senses. 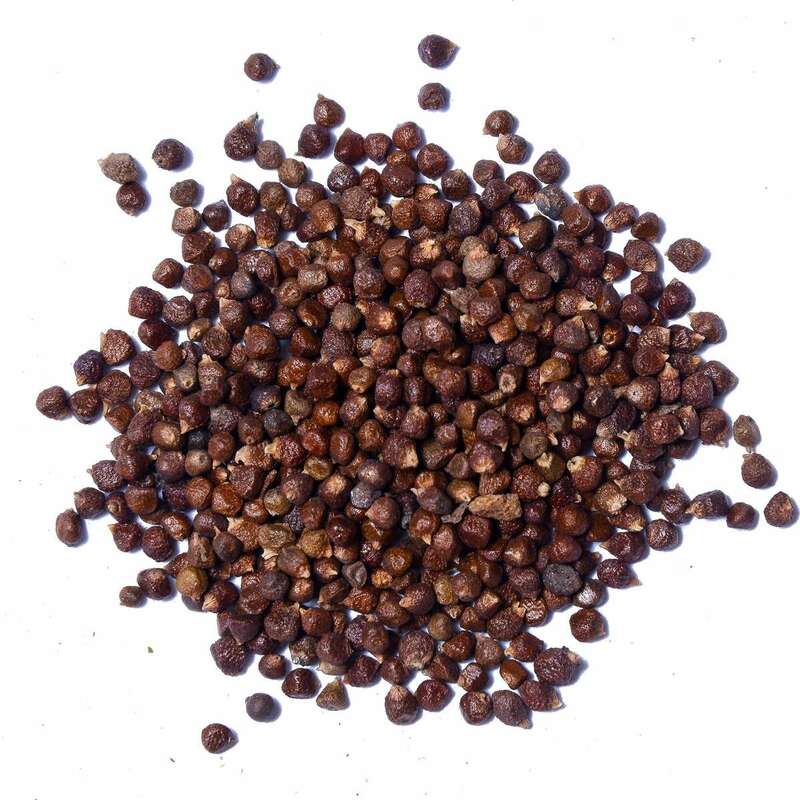 Going by purely organoleptic categories, it might become clear that even the isolated until 1788 Australians used plants like pepperberry, mountain pepper to spice up their food. Tasmannia lanceolata is the tree that produces the Tas- manian pepperberry and leaf. Dr Konczak says ‘It is a very aromatic native pepper which was developed under the Antarctic climate’ when Australia was attached to Gondwanaland. John Newton: "The Oldest Foods in the World. A history of Australian native foods with recipes", New South: Sydney, 2016. Spicy and related words can definitely describe the sensations provoked by various food items. The words seem used most often to describe the substance capsaicin, present in chile peppers. In that sense, assuming there are no capsaicin-bearing Old World plants, the claim is true. In the sense that peppercorns and so on are spicy too, it is false. While it is true that the Capsicum genus (as in chili and the like) comes from Latin America, the Piper genus ("pepper" in its various forms) as well as ginger is native to Asia. Their use in Europe predates the Columbian Exchange by over a thousand years (pepper being rare, but known and available via the Silk Road) and at least 3,000 years (probably much more) in Asia. Ginger has a long history of being used for making spicy food in lack of pepper (which obviously means pepper must have been known). That aside, the mere name Piper is a dead giveaway since it's a Sanscrit word. Sanscrit has been spoken during the last 3,000-4,000 or so years in what region again... Latin America? Well, no. Look farther east. The German translation of "go jump in the lake" which re-translates literally to to "go where the pepper grows" (= India) is a similar hint. I think people are correct when they mention the ambiguity of the term in English, but I think I know what you mean. In Spanish, the spicy sensation of chilli peppers are called "picante". Other "spicy" (as from spice) flavors, such as mustard, we wouldn't call them picante although in English some people might say it's spicy. We would say they are "especiado" (literally means spicy, tastes like spices) but not picante. I believe picante chilli types of flavor all come from the Americas. Asian chilli are not exactly "picante", although for something so abstract as flavor it's difficult to make exact classifications. Not the answer you're looking for? Browse other questions tagged food or ask your own question. What was the reason why Americas didn't take to buckwheat as a crop? Was there a Japanese Exchange, à la Columbian Exchange? What food might they have at the Cold Harbor, Virginia, in 1860? Did starvation or malnutrition occur in indigenous American societies? What was the staple food of the natives of South East Asia before rice? What did babies eat before the advent of modern blenders?